This plugin does not inform your users how to send messages, to which number to send messages or what action keywords needs to be used to make a transfer! It is up to you to inform your users on your setup. First, we need to enter our Twilio Account SID, our phone number with the country code and without any empty spaces. If you store your phone number without a country code appended, make sure you enter the country code here instead. You can also find the two Webhook URLs that you need to enter in your Twilio account. Next we need to setup the action keywords we want to use. The transfer action keyword is mandatory while cancel and balance keywords are optional. Keywords must be single words. It can contain numbers but should be as simple as possible, especially if a user needs to provide a lot of details in their request, like typing the recipient’s email address. The way you type the keywords is the way your users need to send it! This means that if you use capital letters, your users need to do so as well! Next, we need to tell the plugin where our users phone numbers are stored. When we receive a SMS message, we only know what the message says and from which number it was sent. So our first task is to identify that number with a user on our website. The plugin supports looking for phone numbers either in amongst your usermeta or in BuddyPress Profile Fields. In a vast majority of cases, you will store your phone numbers in your usermeta table but some plugins, like BuddyPress, stores things in dedicated tables. For this reason, the plugin will start by looking in your usermeta table before checking BuddyPress (if installed). If the phone numbers are stored in your usermeta table, you need to provide the meta key the number is saved under. If you are using BuddyPress, you need to provide the field name (exactly as you spelled it in BuddyPress). Remember that numbers must be stored unformatted with or without the country code appended! Next, you need to decide how users need to nominate the recipient of the transfer. They can provide either a users numeric ID, their username or their email address. You can not select “Identify by Username” if you allow your users to have spaces in their usernames! Tip: WooCommerce stores customers billing phone number under the usermeta key billing_phone. Next we need to setup feature related settings such as the point type we want to transfer using SMS messages and the reference we want to log transfers under. If you have set the Transfer add-on to enforce a limit you can select if you want this limit to also be enforced with SMS transfers. You can also select if users can attach messages to transfers and if users can cancel a transfer, the maximum time they have to do so. Next we need to set the log entry templates the plugin should use when logging cancellations. The log templates that are used for the actual transfer is controlled by the Transfer add-ons settings further up on the screen. In previous version, there were dedicated fields for this but this duplicate set of fields were removed as of version 2.0. Next we need to setup our SMS replies. These replies are sent to inform the user of how the transfer went. This includes possible errors like the recipient is not found or if the user tries to transfer more points then they have, or success messages. Remember that SMS replies are not free and will be charged. If your account runs out of funds, your users will not receive any SMS messages, not even a warning that you have run out of funds to send a reply. New in version 2.0, you can also inform the transfer recipient of incoming transfers. These replies are sent to the recipient from your Twilio number and are not free. If your account runs out of funds, these notifications will not be sent! Leave the fields empty if you prefer not to send notifications. In order to use this feature, you must enter your Twilio Auth Token, found in your Twilio account. 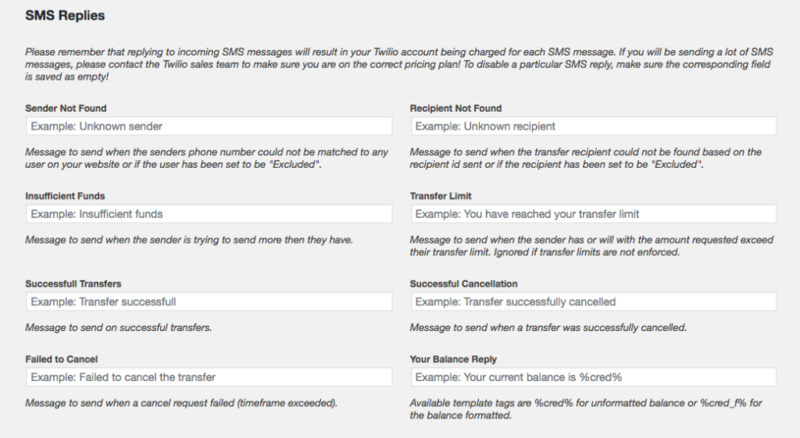 Fill out the fields for the instances where you want to send a SMS notice. Leave the field empty for the instances you do not want to use. If you are using the Pending Transfers feature in the Transfer Plus add-on, you can also set the message the recipient sees if their incoming transfer is pending. The Cancel transfer feature will not work with pending transfers!